MOTIV was an EPSRC collaborative project between the University of Southampton and the University of Cambridge. The project is supported by a stakeholders group comprising KU Leuven, London Underground, Network Rail, Centro, Pandrol UK, URS, and Arup. 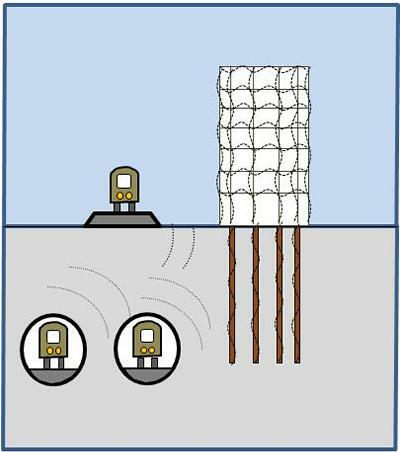 One of the main environmental issues linked with railway transportation in urban areas is ground-borne vibration transmitting to nearby buildings. Ground-borne vibration from railways is generated at the wheel-rail interface due to the passage of individual wheels on tracks (quasi-static loading) and due to irregularities of wheels and tracks (dynamic loading). Vibration propagates to nearby buildings where it causes annoyance to people and malfunctioning of sensitive equipment. Inhabitants of buildings perceive vibration either directly, due to motion of floors and walls, or indirectly as re-radiated noise. Vibration can also cause disturbance due to movement of household objects, especially mirrors or due to rattling of windowpanes and glassware. The problem can be more serious in some circumstances, such as when an underground tunnel passes below sensitive buildings such as a concert hall. WP1 at the University of Southampton has studied the effect of pre-load and non-linear behaviour of resilient elements of tracks using excitation models (i.e. tracks on elastic foundations). The effects of additional excitation mechanisms have also been investigated. WP2 at the University of Cambridge has developed a detailed Periodic Boundary Element model that accounts for the interaction between twin-tunnels, soil, and a pile foundation. A detailed FE model has been developed for a building and coupled to the BE model. The resulting model has been used to investigate the effect of weak coupling between tunnels and between a tunnel and piles. The model has also been used to investigate the effects of soil profile and pile sleeves on ground-borne vibration. WP3 at the University of Southampton has developed a fast running tool based on the wave-superposition method for calculating vibration transmitted to buildings on pile-foundations from surface tracks and from tracks in tunnels embedded in multi-layered ground. The developed model has been used to carry out a parametric study after it was updated and validated by the detailed models developed in WP1 and WP2. A user-friendly interface has been developed for the software which will be made available for practising engineers and researchers. Jones, S., Hussein, M. F. M., & Hunt, H. E. M. (2010). Use of PiP to investigate the effect of a free surface on ground vibration due to underground railways. Acoustics Australia, 38(1), 20-24.